La Flora Organics brings to you handmade aromatic bathing bar enriched with organic Lavender Oil. Hand blended and cold processed for 6 weeks to retain natural glycerine in the soap bar, this one keeps your skin soft, smooth and hydrated. 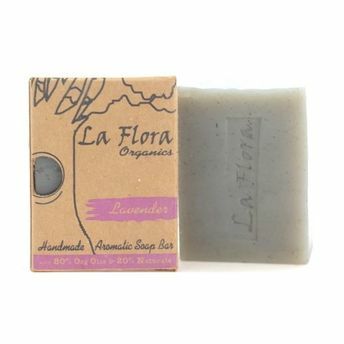 Lavender is known to have excellent calming & relaxing properties apart from being antibacterial.This soap bar has Organic Veg oils like Coconut Oil ,Olive Oil & Sunflower oil that nourish your skin deeply and rejuvenate your skin everytime you take a bath.